As scheduled, the 110th anniversary of Sapa tourism (1903-2013) will be organized in the evening of the 2nd November 2013, at the Sapa central Stadium. On this occasion, the town will hold a ceremony to announce the Decision of the Ministry of Culture, Sports and Tourism recognizing the Sapa terraced field as a national landscape site. 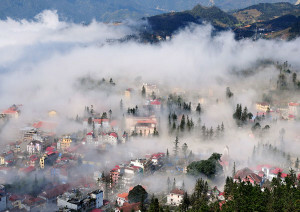 The 110th anniversary with diversified cultural and tourism activities will be a highlight of Sapa in 2013 and is expected to attract more tourists to the area during that time. In the framework of the program, the Lao Cai’s Department of Culture, Sports and Tourism in combination with Sapa People’s Committee will organize the exhibition “Sa Pa – journey to a national tourism urban city” which reflects the achievements of development in the fields of economy, society, culture of ethnic groups in Sa Pa in individual periods. Especially, in the evening of November 2nd, local people and tourists will have chance to enjoy firework and performance of traditional cultural folklore of the ethnic minorities with the theme “Night of Love Exchanges” in area of tennis courts and Xuan Vien garden in Sa Pa Town. In the first 6 months of 2013, Lao Cai Province attracts 640,290 tourist arrivals, of which international arrivals were 278,700 and domestic arrivals were 361,590. The total tourism receipts reached nearly VND 1,300 billion. It is expected in the whole year of 2013, Lao Cai Province will attract 1,180,000 tourist arrivals.